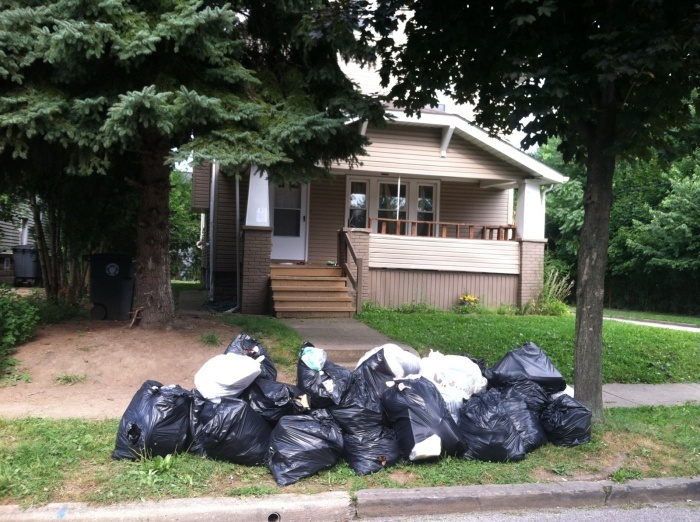 The City of Akron provides trash and recycling collection once a week to residents of one, two, and three family freestanding residential units. Please use this page and the items to the right to find answers to your questions. Below is an interactive map to determine your trash and recycling collection day. You may zoom to your area if your mouse has a dial. You may also type your address in the box and it will zoom to your location. The legend is on the right to show your collection day. Click here to bring up a separate web page and a larger map. 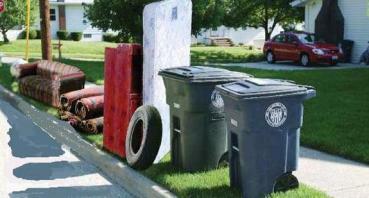 For more information, please click here to view the Trash Service Brochure. We offer two ways to dispose of unwanted items that will not fit into your cart such as couches and refrigerators or a large volume of trash such as after moving or cleaning out your basement. 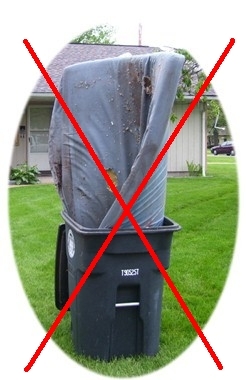 Each week on your normal trash and recycling day, you may place large items on the curb next to your trash carts such as furniture and appliances. You will not be charged extra and there is no need to schedule ahead. You must preschedule a pick up if you have a large amount of bags, boxes, or trash after cleaning out your house, basement, garage, or moving out. Each home will be allowed 3 Special Bulk Volume Pickups per year. Most importantly, you MUST pre-schedule this pick up at least 1 working day before your collection day. Do not place the trash on your curb until 4:30 p.m. the day before your collection day. Please pre-schedule by calling our 3-1-1 Call Center by dialing 3-1-1 from a landline phone inside the city or at 330-375-2311 from a cell phone. If you have a medical condition that keeps you from being able to place your carts at the curb and you don't have anyone that can assist, we want to help! Please click here to print the form. After completing your information, you will need to have your physician sign and verify your condition. Then send it to the address on the bottom. If you have any questions, please call the 3-1-1 Call Center. For hours of operation or to view your account online, please click here to visit the billing office website.